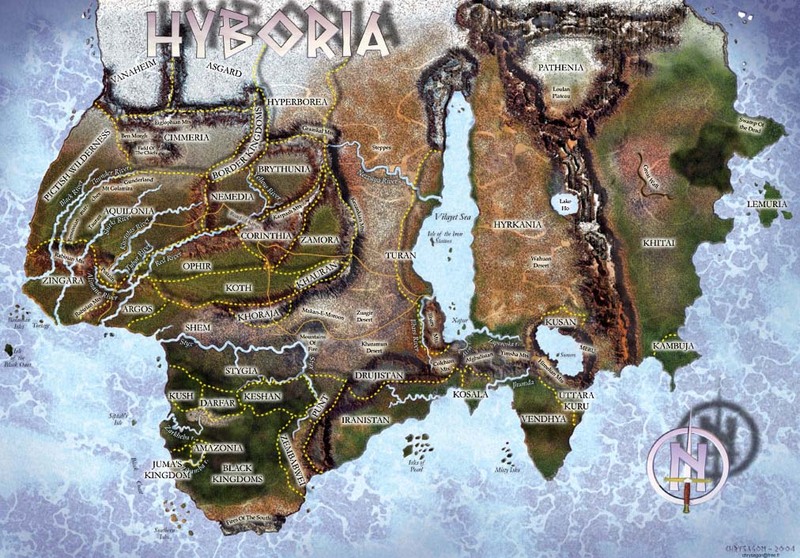 Some 15,000 years ago the kingdoms of the Hyborians – Aquilonia, Nemedia, Brythunia, Hyperborea, Koth, Ophir, Argos, Corinthia and the Border Kingdom – dominated the Western world. Zamora lies to the East, Zingara to the Southwest of these. Far to the South sleeps Stygia, untouched by foreign invasions, though the peoples of Shem have exchanged the Stygian yoke for the less galling one of Koth. The Stygians have been driven South of the great river Styx, also called Nilus or Nile, which empties into the Western Sea. North of Aquilonia are the Cimmerians, ferocioius savages untamed by any invaders. Descended from the ancient Atlanteans, they are progressing more rapidly than their old enemies, the Picts, who dwell in the wilderness West of Aquilonia. The Hybori peoples are the possessors of a virile civilization, whose most powerful kingdom is Aquilonia, though others vie with it in strength and splendor. They are the supreme in the Western world. In the North, however, golden-haired, blue-eyed barbarians have driven the remaining Hyborian tribes out of all the snow-countries except Hyperborea. Their land is known as Nordheim, and they are divided into the red-haried Vanir and the yellow-haired Aesir. Now the Lemurians enter history again, as Hyrkanians. Pushing westward, one tribe establishes the kingdom of Turan on the Southwestern shore of the inland Vilayet Sea. Later, other Hyrkanian clans push westward around that sea’s northern extremity. Glancing briefly at the peoples of that age, the dominant Hyborians are no longer uniformly twany-haired and grey-eyed; they have mixed with other races, but this mixing has not weakened them. The Shemites are men of medium height with hawk noses, dark eyes and blue-black beards. The ruling classes of Stygia are tall men, dusky and straight-featured. The Hyrkanians are dark and generally tall and slender. The people of Nordheim retain their light skin, blue eyes and red or yellow hair. The Picts are the same type as they always were; short, very dark with black eyes and hair. The Cimmerians are tall and powerful, with dark hair and blue or grey eyes. South of Stygia are the vast black kingdoms of the Amazons, the Kushites, the Atlaians and the hybrid empire of Zembabwei. Between Aquilonia and the Pictish wilderness lie the Bossonian Marches, peopled by descendents of an aboriginal race mixed with Hyborians. They are stubborn fighters and great archers, as they must be to have survived centuries of warfare with the barbarians to the North and West. Our story starts in Nemedia, along the Road of Kings.